These rabbits are available for adoption from shelters, rescue groups, and individuals. Each group has it's own application process and adoption fees. If you are interested in meeting one of these bunnies, please contact the group or individual directly. If you are a new bunny owner, we recommend checking out House Rabbits 101. Charming is definitely a handsome prince! This fellow was named for his personality, and he's ready to charm his way into your heart! Meet him at APS of Durham! Hello! My name is Tabitha! I was rescued with several of my siblings last summer, and I have loved being a house rabbit! I enjoy my cardboard castle, tunnels, and boxes. Greens are pretty good too, and parsley is one of my favorites. I like to explore, so I need a large enclosure with plenty of time out to play. After my expeditions, I like to be rubbed on the head. To learn about adopting me, email Triangle Rabbits or fill out an adoption interest form! Hello! What has eight legs and can't wait to go home with you? It's us! My name is Eleanor and this is my sister, Zoe. We're just two spunky buns looking for a forever home where we can spend our days munching on all the hay and goodies our hearts could desire, getting attention from our adoring family, and doing binkies all over the place! We'll need a big enclosure for when we can't be out exploring and stretching our legs, and a nice bunny-proof space for when we can. Lots of toys to chew and toss around would be amazing, too. We love greens, so if we could have some for snack time, we'd be ever so hoppy! After that, it'll be time to settle in for some snuggles and ear scratches! What do you think? Are you ready for your life to be a lot more bouncy and fun? Let's get going at the SPCA of Wake County. Hello! I'm Lora! Let me tell you a bit about myself. I love food (I mean I really love it)! I will come running whenever I hear the treat bag. My favorite veggies are carrot tops, dandelion greens, and parsley. I am a good hay eater, which is important to keep my teeth in good shape and help me feel my best. I enjoy decorating, and will rearrange my blankets for hours to get them just right. I can be a bit protective of my perfect house arrangement (I spent all that time on it, you know), so I may not be best for a home with children. I enjoy soft music and nose rubs. I am currently fostering in the New Hanover County, NC area. To learn more, email Triangle Rabbits or fill out an adoption interest form! Bonjour! It is a pleasure to welcome you to my enclosure. I am Henrietta, and I have been looking to make an upgrade to my living situation. I think you would be the perfect family to help me do that! I would love plenty of space to stretch my legs and binky about like bunnies do when they are happy. I am happiest when I have all the fresh hay and toys to chew on throughout the day! We can hang out in an area that is safe for me to be outside of my enclosure while we get to know each other, that gives me time to be the social butterfly that I truly am! Do you have the time and love to share with me every day? Let's hop outta here and get settled at home then! Ask about me at the SPCA of Wake County. I'm Thumper! I am about seven months old, and full of young bunny energy! I love to explore (and get into things), and I will need a very bunny-proofed space. I am a playful fellow, and I entertain my foster family doing binkies and zoomies all around the house. I'm working on learning bunny manners, and occasionally mistake fingers for carrot (an easy mistake to make, really). I am currently fostering in Raleigh-Durham, NC. To learn about adopting me, email Triangle Rabbits or fill out an adoption interest form! Hoppin' around here isn't nearly as much fun as hoppin' around in my forever home! Are you here to take me to mine? My name is Batman and I can't wait to get to know you. You want to get to know ME first? Okay, well, I really enjoy my timothy hay, and am pretty good at solving puzzles when my hay or some rabbit-safe fruits and veggies are involved. I don't always enjoy being picked up, but I do enjoy attention once I get to know you. If we're out and about together in a nice rabbit-safe environment, then I'll hop on over to you whenever I need a nice scratch behind the ears. Am I what you're looking for? Wonderful! Let's go home. Meet me at the SPCA of Wake County. Hello there! Have you heard of that cartoon called Tom and Jerry? You know, the dynamic duo always looking for mischief and chasing each other around? Well, we are not those two characters, but we will provide just as much entertainment! I'm Tom, and my buddy, Jerry, and I want to find a home with a big enclosure for us to lounge in when we can't be out with you. You'll need twice the hay and fresh greens, but you'll receive twice the love and bunny cuteness in return! We, much like the pair we mentioned before, love to hop around and play chase, too. That means we need a space safe for bunnies to run around in. We would love to spend that time with our forever family, too! Rabbits are social creatures, we can share our snacks and chew toys with each other and our bunny antics can be shared with you! Are you ready to go home now? C'mon! Ask about us at the SPCA of Wake County. Hello there! I’m Sammy, and I’m looking for a home of my own. I love to see life from the top of my cardboard box house; the view is great from there! I love bananas and raspberries (what bunny doesn’t? ), but I think parsley is best left for guinea pigs. Maybe the menu at my new house will have tastier veggies. I enjoy nose rubs sometimes, but I'd rather go exploring than snuggle. Other pets might be ok, but big dogs make me nervous. If you are the perfect match for me, email Triangle Rabbits or fill out an adoption interest form! Hello! My name is Pixel! I am looking for a new home of my very own. I love veggies, and leaf lettuce is one of my favorites. I like small pieces of celery, too! I am a mature, independent lady and I enjoy exploring and jumping on the bed. Exercise is important, and I never miss my daily run through the house. I may be little, but I can add plenty of color to your life! 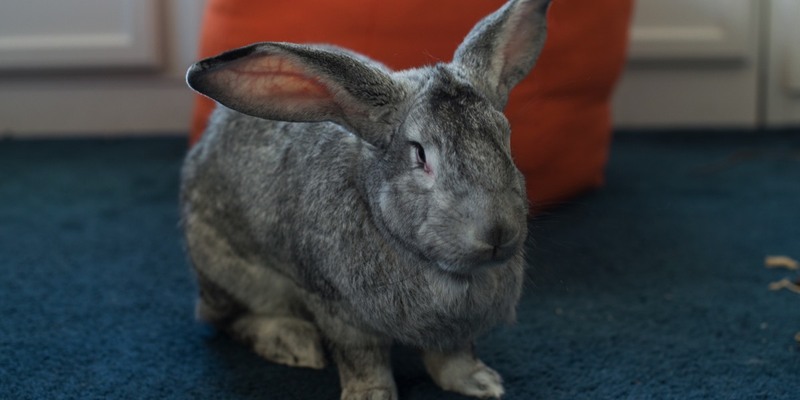 To learn about adopting me, email Triangle Rabbits or fill out an adoption interest form!